Eurydice is a minor figure in Greek mythology, and yet the name of Eurydice is one of the most recognisable, for Eurydice was the wife of Orpheus and the reason for the Greek hero’s descent into the Underworld. The name of Eurydice is not an uncommon one in Greek mythology, but in truth, little is written in ancient sources about the Eurydice connected with Orpheus. It is commonly said that this Eurydice was a Dryad, and nymph of trees and woodlands, although it was occasionally said that Eurydice was also a daughter of Apollo, Apollo being the Greek god who taught Orpheus how to play the lyre. Eurydice comes to prominence when she is named as the wife of Orpheus, with the presumption being that the nymph had fallen in love with the music of the great musician, as he played the lyre beneath Eurydice’s tree. Eurydice and Orpheus were very much in love, and the music played by Orpheus at their wedding was amongst the greatest ever composed and played. Eurydice and Orpheus would not be long wed though, before Eurydice died. In the earliest tellings of the Eurydice myth, no reason for the death of Eurydice is given, but in later mythology it was said that Eurydice had stepped upon a poisonous snake as she played in a meadow with some naiads. Still later versions of the Eurydice myth tell of Eurydice running through the meadow as she sought to escape the attention of the rustic god Aristaeus, who had taken up the form of a swarm of bees. In any case now deceased, Eurydice descended to the Underworld where she became a resident in the realm of Hades. The music that Orpheus now played for Eurydice was as great as anything that had gone before it, but the music now was the saddest of all time, bringing all who heard it to tears. Orpheus would be convinced by nymphs that he might be able to be reunited with Eurydice if he descended into the Underworld, and asked Hades to give his wife back. So Orpheus descended into the realm of Hades through the gate at Taenarus. In the Underworld Orpheus’ music convinced Charon to allow him passage across the Acheron, whilst the playing of the lyre also lulled Cerberus to sleep. The music also brought Hades and Persephone, and even the Erinyes, to tears, and so permission was given for Eurydice to return to the land of the living. 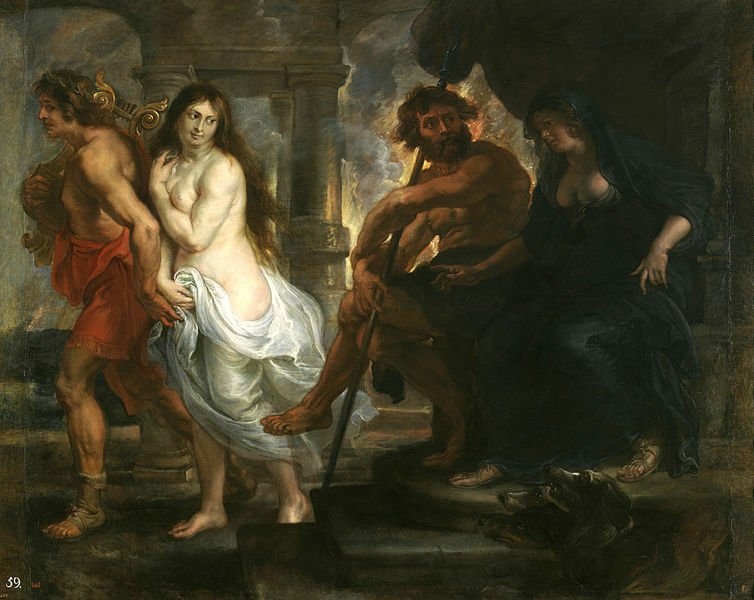 There was though a stipulation given to this permission, for Eurydice was to follow behind Orpheus, and Orpheus was not to gaze upon his wife until both had exited the realm of Hades (or reached the threshold of their own house). Thus Eurydice set off from the realm of Hades, something that few deceased souls ever did. Eurydice though would not reunited at this point with her husband though, for as Orpheus exited the Underworld, he began to have doubts that Eurydice was indeed behind him, and thus Orpheus turned to look. Eurydice was indeed behind Orpheus, but she had not exited the realm of Hades, and so Eurydice immediately disappeared from view, back to the Underworld where she would spend all eternity. 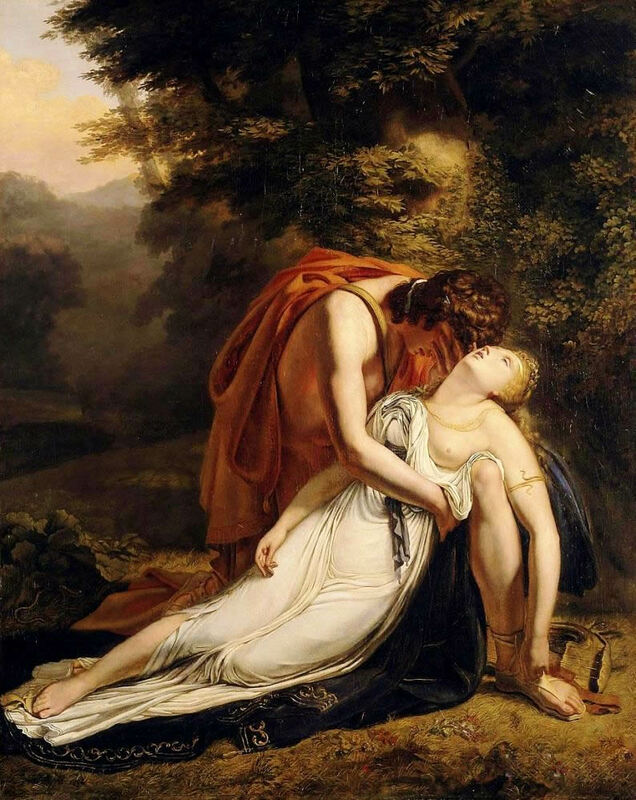 It was though not too long before Eurydice would be reunited with Orpheus, for some tell of the Greek hero killing himself when he realised that he had lost Eurydice for the second time. Others tell of Orpheus being killed by the Maenads. In either case though Orpheus himself was now a resident of the Underworld, and he and Eurydice would be reunited in Elysium.